Micro Trawler is a revolutionary boat! Before her introduction, it was assumed that you would need at least 24 ft. of length and a gas guzzling 150 hp to be able to go over 25 m.p.h. in a boat with two 6 ft 6" berths, two lounging seats, standing headroom in the galley and helm station with a comfortable helmsman chair. Yet amazingly, we accomplish all this with Micro Trawler's 14 ft 6" and 45hp! 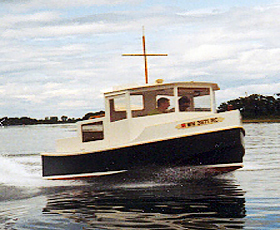 Since her introduction in 1992, she has been one of Common Sense Boats most in-demand boats. Micro Trawler is as significant to powerboats as Micro is to sailboats. Who can resist a mini tug with Micro Trawler's useful space, excellent slow speed manners and the capability to go over 25 m.p.h. when asked? She is easy and inexpensive to build and trailer, all in a fourteen and a half foot boat or 18 foot boat. It is challenging just to contemplate a boat this size with as much interior space. She is revolutionizing owner expectations of small power boats! Many Micro Trawler owners also think she is revolutionizing the travel trailer industry as well, as they find this is a perfect double duty for their boats. We designed this boat for taped seam construction (i.e. : "stitch and glue", tack and tape" etc.). This incredibly strong and easy building technique keeps Micro Trawler well within the capabilities of any amateur boat builder. The plans include a special isometric that show the unusual building sequence of sharpies. The cost and time invested in building a Micro Trawler will give you a unique, fun and useful boat. She can also double as a travel trailer. All for less than the cost of a trailer for a conventional boat that does what Micro Trawler can do! You cannot buy a comparable boat less than 20' at any price!